There are two personal benefits from Cash for Clunkers. One is the voucher. That one's obvious. (See this post with a link to the final June 18 plan and voucher descriptions.) But the other benefit is the dollar value of the gas savings that result from a trade in. 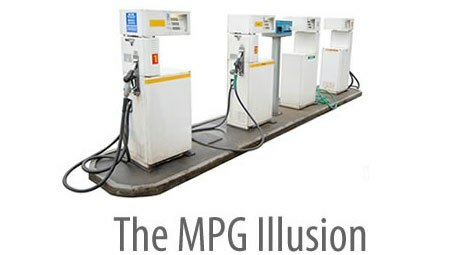 That one is less obvious because gas savings are a curvilinear function of MPG increases. In many cases--especially for very inefficient cars--the savings in gas costs will be larger than the rebate. In that sense, the gas savings can be thought of as a kind of "matching" program for the voucher. It doubles the value of the voucher. To read each table, look in the top row of numbers for the MPG level of your current vehicle. Then read down that column to see the amount of gas (or money) you will save over 10,000 miles of driving by buying a car with higher levels of MPG. This table can help car buyers and car dealers make more accurate judgments of gas consumption when comparing an old car with a new car. Please share it with others. Imagine you have a truck that gets 14 MPG and you drive it 15,000 miles per year. Suppose you trade it in for a vehicle that gets 20 MPG. You qualify for a $4,500 voucher. But you'll also save more than 300 gallons of gas over 15,000 miles of driving. At $2.50 a gallon, that will save more than $4,500 over six years of driving. Trading in a 14 MPG vehicle for a 20 MPG vehicle is worth $9,000 over six years (gas savings + voucher). An interesting contrast is if you trade in a 14 MPG truck for a 15 MPG truck. In that case, you get the $3,500 voucher, but save only 75 gallons of gas over 15,000 miles of driving. At $2.50 a gallon, that will save only $1,125 over 6 years of driving. Going from 14 to 15 MPG vehicle is worth about $4,500 over six years when you combine the voucher and gas savings--just half the value of trading in the truck for a 20 MPG vehicle. In implementing Cash for Clunkers, it would be helpful if the press--and, later on, car dealerships--could focus on the dual sources of personal benefit from the trade in of low MPG cars: The benefit is the sum of the voucher value and the gas savings. It takes only small MPG improvements to yield large gas (and money) savings on cars in the teens. For the right, modest increase in MPG, the dollar value of gas savings will be larger than the voucher. That's the message of GPM. For older posts on Cash for Clunkers, see the blog archive on the right.